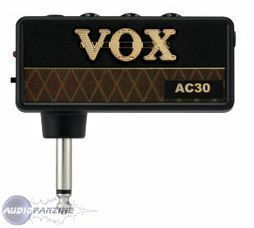 amPlug AC30, Portable Guitar Amp Simulator from Vox in the amPlug series. 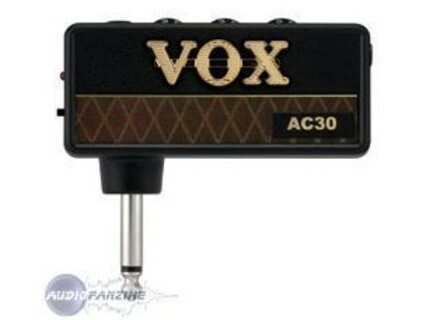 Product replaced by the Vox amPlug AC30 v2. VOX exhibits the amPlug palm-sized, battery powered headphone guitar amplifier. Users can plug it directly into their guitar (via its built-in 1/4" plug), and enjoy guitar sounds anywhere, anytime. Additionally, an AUX input jack allows the user to jam along with an iPod or MP3 player. The amPlug is available in three different sound styles: amPlug AC30, for signature VOX AC30 top boost tone; amPlug Classic Rock, which delivers the sound of a “classic” British 100-Watt head; and amPlug Metal, which is based on a U.S. made high-gain amplifier head that delivers metal high-gain tone. Visually, the amPlug looks like a miniature VOX amplifier, complete with a simulation of the classic VOX black vinyl covering and the famous VOX diamond grill cloth. Using proprietary analog modeling technology, the amPlug accurately reproduces the complex and warm distortion that is distinctive of a vacuum tube, as well as the powerful high gain produced by a large amp stack, despite its ultra-compact dimensions (3.39" x 3.15" x 1.22") and weight (1.41oz., not including batteries). It offers up to twenty hours of battery life from 2 AAA batteries. [Musikmesse] Korg Pitchjack Korg introduces the pitchjack, a new addition to its tuner line that is designed to deliver accuracy and reliability in a handy plug-in package. [Musikmesse] Behringer Keyboard Trio The fourth and last pack in Behringer's Trio Pedal Chain series is aimed at Keyboard players. The TPK989 KEYBOARD TRIO features the UT100 Ultra Tremolo, the UC200 Ultra Chorus and the FX600 Digital Multi-Effects pedals.